Illustration for "Roman de la Rose"
bl.uk > Online Gallery Home	> Online exhibitions	> Illuminated manuscripts	> Illustration for "Roman de la Rose"
Manuscript from the end of the 15th century illustrating "Roman de la Rose", a popular mid-13th-century poem. "The Romance of the Rose" was composed in France, at the height of the age of chivalry and courtly love, by Guillaume de Lorris. The author's avowed intention was to expound the "whole art of love". His story is set within a walled garden belonging to a nobleman called Déduit - the French word for 'pleasure'. 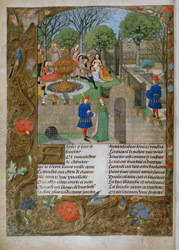 Here the narrator endeavours to reach the rose that symbolises his lady's love. On the way he encounters a series of allegorical characters, each an expression of the object of his affections, who provide a charming commentary on the psychology of romantic love. The fictional garden was planted with date palms and spice trees, as well as peaches, quinces, cherries and nuts. It was carpeted with flowers of every colour and season, and inhabited by gentle creatures of the forest: deer, rabbits and squirrels. 'Roman de la Rose' was left unfinished when Guillaume de Lorris died and was completed, some forty years later, by Jean de Meun Clopinel.